In this tutorial I will discuss, how to interface an Ultrasonic distance sensor (HC-SR04) with ARM Cortex-M3 LPC1768 microcontroller. The HC-SR04 Ultrasonic Distance/Ranging Sensor uses ultrasound to measure distance from a object ahead of the sensor. Ultrasound is a soundwave having frequency greater than the audible limit i.e. > 20Khz. HCSR-04 module uses 40Khz ultrasound to measure distance between itself and any object ahead of it with a sensing range of 2 centimeters to 4 meters. Pinout: The module has got 4 pins viz. VCC(+5V), TRIG, ECHO, GND. Ultrasonic Distance/Ranging Sensors are based on similar working principle to what is used in SONAR. 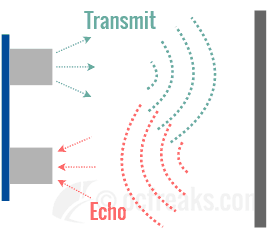 It has got two transducers, one for transmitting ultrasound and second one for receiving the echo. Based on the time it takes for the echo to arrive we can compute the distance, since we already know the speed of sound in air which is around 343 m/s or 1235 km/h (at 20°C). To start distance measurement a short pulse of 10us is applied to Trigger pin. After receiving trigger pulse, the HC-SR04 Module sends a burst of 8 ultrasonic pulses at 40Khz. It will then output a HIGH for the amount to time taken for the sound waves to reach back. The pulse HIGH time is measured and then used to calculate the distance. After this we divide the computed value by 2 since the waves have traveled double distance. In the interfacing example given below, P0.0 of LPC176x is configured as output and connected to TRIG pin and P0.1 is configured as input and connected to ECHO pin of the Ultrasonic Distance sensor. Timer0 module is used for generating delays with 1 us resolution. It is also used to measure time for ECHO pulse using two simple functions viz. startTimer0() & stopTimer0(). You can check the project source code linked below for implementation details. 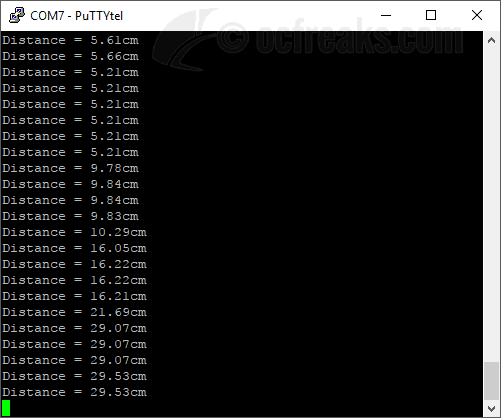 The distance data is sent to Terminal via UART0. 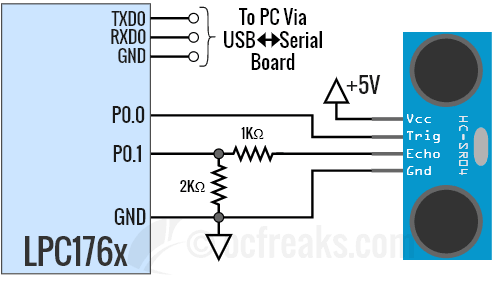 You can refer my LPC1768 UART Tutorial for more. The example source code also contains retargeted printf() for KEIL which redirects its output to UART0. The HC-SR04 Ultrasonic module operates on 5 Volts and hence the output HIGH on ECHO pin is also 5V. We can directly interface this on any of the GPIO pin which has a 5V tolerant pad. But its better to use a voltage divider (using 2K and 1K resistors) to get input from ECHO pin for additional safety. Note that we don’t need to translate 3.3V to 5V for TRIG pin since 3.3V is already a HIGH for TTL compatible input pins. Interfacing HC-SR04 Ultrasonic Distance/Ranging sensor with LPC1768/LPC1769 - Example Source Code for KEIL ARM. KEIL ARM uV5 Project for example given above is on GitHub @ HCSR04 Ultrasonic Distance Sensor Interfacing with LPC1768 [Successfully tested on Keil uV5.23], Download Project Zip. You can find the HEX file inside objects folder.